A driver ventures down a flooded road made impassable by coastal flooding in Rye, N.H. Photo credit: Kim Reed. 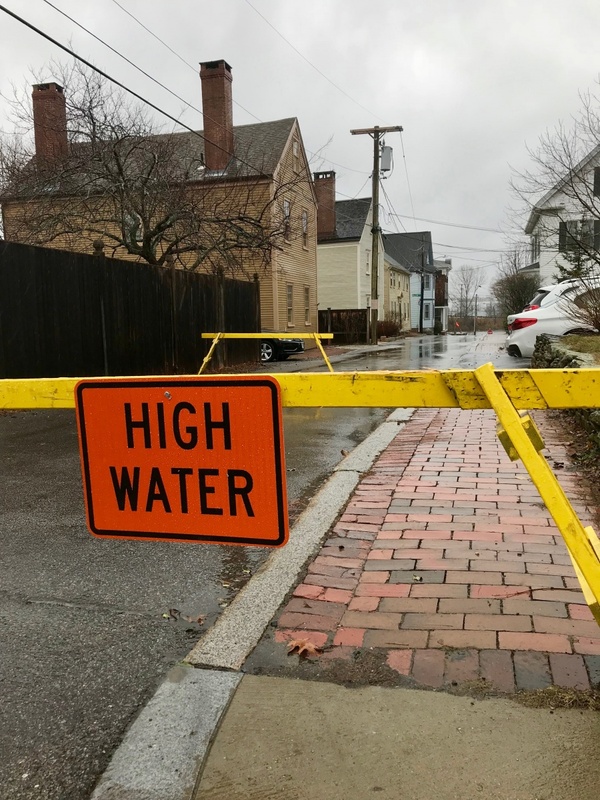 New research from UNH confirms something anyone in Hampton, N.H., or Scituate, Mass., or along the Jersey Shore has experienced first-hand: High tide floods, or so-called “nuisance flooding,” are occurring far more frequently than ever before. In fact, this flooding along shore roadways during seasonal high tides or minor wind events has increased a whopping 90 percent over the past 20 years along the East Coast, resulting in impassable roads, delays and disrupted transportation of goods and services. And it’s likely to get much worse. Roads closed due to high tide floods in Portsmouth, N.H. Photo by Lisa Graichen. These findings will help researchers and transportation planners better understand the type and extent of roadway infrastructures that are vulnerable to high tide flooding and the transportation impacts now and in the future due to sea level rise. Jacobs and her co-authors found that tidal nuisance flooding threatens more than 7,500 miles of roadways along the entire East Coast, with more than 400 miles of that being interstate roads. They estimate that this causes more than 100 million hours of delays each year for drivers on those roads, and that number could rise to more than 3.4 billion hours by 2100. By the middle of the century (2056 –2065), the researchers predict nuisance flooding could occur almost daily at specific sites along the shores of Connecticut, New Jersey, Maryland, the District of Columbia, North Carolina and Florida under an intermediate sea-level-rise scenario. Jacobs and her co-authors (from the U.S. Department of Transportation and the National Oceanic and Atmospheric Administration, or NOAA) note that these effects are not limited to storms. They say that critical transportation infrastructure is at risk from sea level rise alone, which numerous transportation agencies project to be between one to eight feet, along the U.S. Atlantic and Gulf Coasts. Vulnerable roads were identified using data from the Federal Highway Administration’s Highway Performance Monitoring System and NOAA’s Center for Operational Oceanographic Products and Services. They looked at flood frequency maps, tidal gauge historic observations, and future projections of annual minor tidal flood frequencies and durations. This research was funded by U.S. National Science Foundation research grant (CBET-1231326).